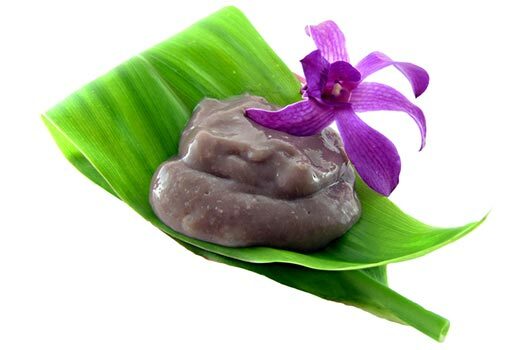 Liven up your family’s healthy diet with some tasty taro recipes! This super nutritious vegetable has been a staple of Asian, Indian, African and the Pacific Islands. Although it’s not so popular in most U.S. cuisine, it has a rich history in Hawaiian culture and was considered to be a deity. We love taro because it’s versatile and a nutritional powerhouse. Taro root is similar to potatoes but it has a much lower glycemic index. It’s also fat-free, extremely high in fiber and a good source of vitamins E, B and C as well as potassium, magnesium and copper. You can also eat the leaves, which are also rich in protein. A word of caution: taro must be cooked and if you eat the leaves, the top, hairy layer has to be removed or it can be toxic. It contains calcium oxalate, which can cause kidney stones. It has a thick skin, which should be thoroughly washed before peeling because it can cause skin irritation.